The easiest, quickest way to describe Alcaeus in his human form is handsome. Like, devilishly handsome. To start, he has a heart-shaped 'baby face'. At only 18 years old in his human form, he has only just begun to grow facial hair. However, he shaves it off to show off his chiseled jawline and high cheek bones. He's got well groomed eyebrows and bright, fire red eyes. Alcaeus has a beautiful head of thick, red-chestnut hair that he keeps shorter on the sides and spikes the longer bits in the middle. Alcaeus has an athletic build: He isn't skinny nor boarder-line overweight. He is slim, with well defined muscles and easily has a six-pack if he flexes hard enough. His style would be best described as punk-rock. He loves jeans that are baggy, but fit well. He is usually found in a white or black tank top and always, always wearing a black leather jacket. Lastly, his choice of footwear are either black leather shoes or the typical worn runner. Think young Johnny Depp for his looks. Alcaeus is a happy medium between his parents. He has some of his father's finest features: A lion mane, two sets of fangs, cloven hooves, and a partial lion tail. I say partial because right at the base of his tail is a tuft of a normal horse tail and then again at the tip of his leonine tail. While he's got his mother's good looks. His mane is a regal chestnut color with darker tips in some spots. The lion mane curves with the arch of his neck, but gets longer into his forelock. His tail tufts are chestnut and green at the top, while the bottom is chestnut with the same green but can often look deep green to almost blue. Alcaeus's body is a healthy mix between his mother and father. The base for everything is the same chestnut his father is, while the rest is splashed in blues, purples, greens, and some grays. On his two front legs and around his eyes are vibrant mint colored glow spots. They don't actually glow, but the way they sit on his multi-colored coat, they look like it. Lastly, Alcaeus has vibrant blood red eyes just like his father, except they hold the kindness of his mother. Alcaeus has another form as well! He has a stunning lion form that he rocks amazingly well. 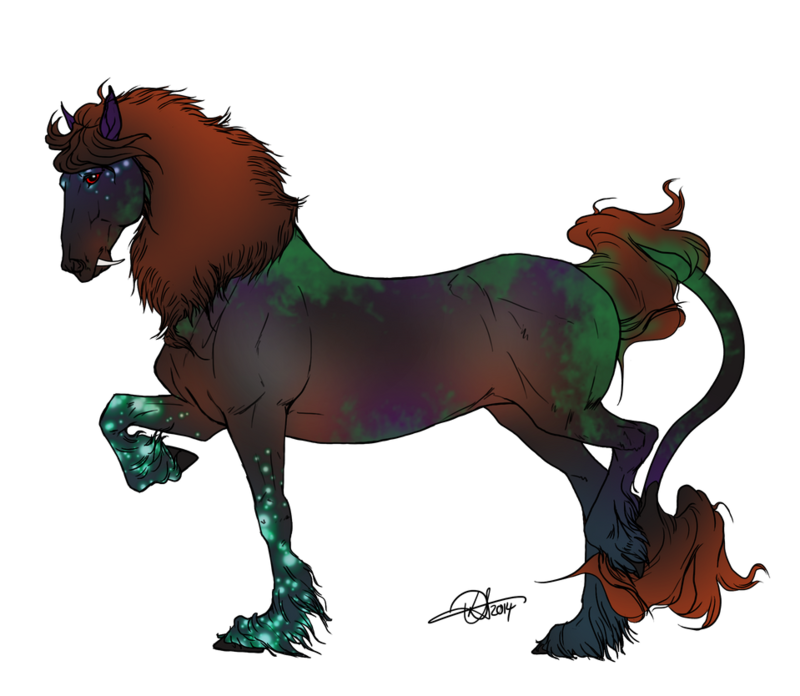 Though in horse form he has splotches of galaxy coloring, as a lion he is a beautiful shade of chocolate brown. His mane is large and fluffy, similar to his mane in horse form. However unlike the chestnuty-red tones of his mane and head of hair, Alcaeus's lion man in lion form is also chocolate brown with caramel highlights. He also still has his fire red eyes, which is distinct in all three forms. In height, Alcaeus is about four feet, five inches. He is slightly taller than average for a male lion, but you'd never really notice unless he is side by side to a regular lion. He doesn't mind the height he was given in this form and strides confidently with it. Alcaeus is very proud of his lion form and typically keeps the coat clean from the dirt and grime that anyone can get a build up on. It's very rare you will see any dirt on Alcaeus while he's a lion. As any other form, sure, but as a lion no way. As a foal, Alcaeus was bright and full of life. He was curious about anything and everything, often leading him to wander off and get lost. In turn, getting lost also meant getting into danger, and Alcaeus seemed to get rather excited about said danger. Leading his sister or friends into dangerous places to stir up trouble seems to be his expertise. He enjoys provoking others, including predators, in hopes to make them angry. Though a troublemaker, Alcaeus was an overall sweet and caring little guy. If someone was slow in a game he and someone else was playing, he would willingly lose to let the other enjoy the game and get stronger. He, much like his mother, doesn't discriminate against others and welcomes anyone of all shapes, sizes, and ages to join in on the fun. Around the danger, you could find Alcaeus enjoying the innocence of butterflies and birds or learning about all there is to learn about the world he was born into. He makes friends easily, but will grow to make enemies just as easily. After his accidental ingestion of a magical mushroom, Alcaeus found himself two and a half years older than what he had been. Now three years old, Alcaeus is quite confused as to where to go with his personality. He is still a child, learning about the world and curious about everything. But he is developing the inevitable arrogance young stallions usually develop at three years of age. Cocky or full of himself describe him best at the current moment. She tried, almost effortlessly, to build on that darkness but she also urged him to protect his sister at all cost. And so Alcaeus did, he protected Calli from the dangers, hovering around her hesitantly to make sure she was okay. Their mother appreciated it deeply, though never verbally told him such. It wasn't until he was about six months old that he ventured into his alliance's shrine and asked to have his position under Vasanta's rule revoked. He didn't believe in the deity of Spring, of everything good in the world. He was tainted, but not in just his heart. While at Vasanta's shrine, Alcaeus ended up eating a mouthful of magic mushrooms that soon put him to sleep. Upon waking up, he found himself fully grown at his 16.1 hands high and sporting his full grown lions mane. 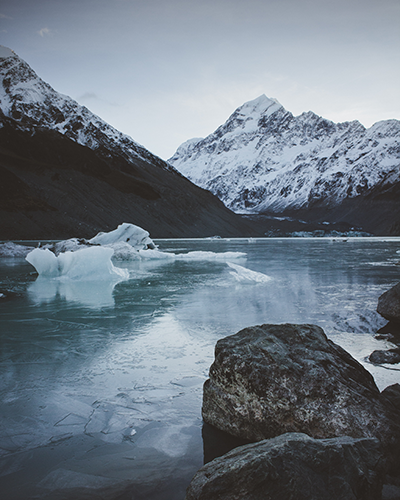 Confusion hit hard and he soon had to say goodbye to his mother, desperate to flee the confusion and hatred that quickly filled almost every crevasse of his heart. Callisto came with him, after eating her own mushroom and growing to her full height. He admired his sister's looks, telling her how gorgeous or beautiful she was and that their mother is proud of the two of them. He sticks close to her, not willing to lose another family member. Before they left their homelands, however, Alcaeus ran into a stallion who issued a challenge. Fighting the stallion, Matsumi ended up helping but got caught in the crossfire and was accidentally killed. The fight quickly ended with Alcaeus screaming in agony as he felt the connection between him and the tawny lioness shatter into a million pieces. It was with this fight that Alcaeus fled with his twin, refusing to tell his mother or anyone he had spoken to. He also refused to speak to Callisto about it, drowning the memories with Matsumi with a thick blanket of anger in the darkest parts of his mind. 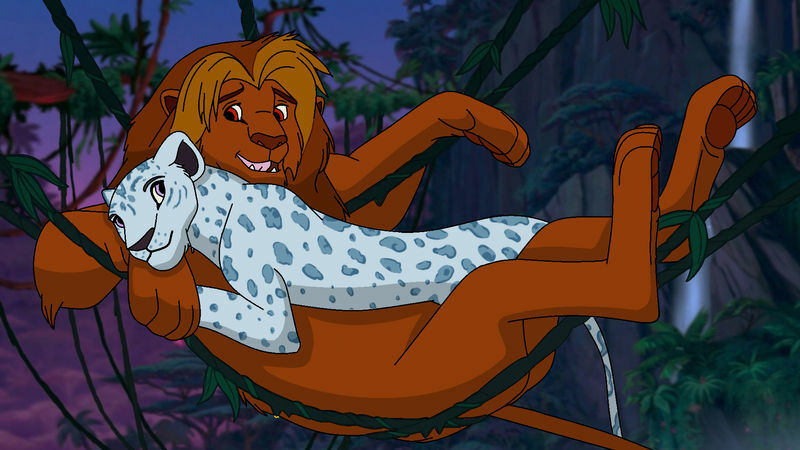 He would forget about the lioness. Gaining the electricity control from his mother's side, Alcaeus was quick to realize that he couldn't manipulate it the same way she could. Where she could call upon the sky and lightning storms to strengthen her powers, Alcaeus is unfortunately unable to do this. Alcaeus has the ability to generate his electrical powers, meaning he is the charge for it. He is able to electrify himself so that if someone unwanted touches him, they will be shocked. The shock, only at a level one, will only cause minor electrical burns or cause a simple shock. He is unable to hurt anyone too seriously at this stage. Though it's still only the first level, Alcaeus is able to cut the power in any building, fueling his own charge with the power. But he also able to do the opposite and bring light to places that are either dimly lit or have no lighting at all. But it doesn't matter how he uses his magic, it will always leave him weak with a wide range of minor headaches to mind splitting migraines. At the second level, Alcaeus's magic is amplified. His charges within his body are now able to cause actual friction on his skin that is visible to the naked eye. His skin will spark and sputter throughout the day to let him know that the charge is high and prepared for any uses. While he can spark and sputter, he is able to control how strong of a shock these give off. The shock can range from warming the body to a more severe electrical burn that'll take several days to heal. Still being able to cut the power in buildings, Alcaeus can now cut the power from multiple buildings to feed his charge to an incredible amount. With this, he is able to project short bouts of lightning or electrical current from his body to protect himself. Much like the sparks and sputters, the amount of damage depends on the situation. The side effects from all of this is about the same, he will still experience the headaches and migraines, but they don't last nearly as long. Starting out early, Alcaeus has gained his earth control magic from his father's side. Without knowing his father, he has no idea if his powers are the same or different and he will never know. However, his magic for this is very minimal or even considered weak. He is able to control rocks, or a rock like matter. He is able to move it with his mind, or even make it grow or shrink. While still only doing the bare minimum, Alcaeus is also able to cause the earth to shift and create small holes in the ground that can be a range of incredibly deep or a simple little divot in the ground. He's also able to cause the dust to fly off the ground for a short amount of time. However, these more heavier parts of his magic cause him to get severe nose bleeds. He isn't fond of the nose bleeds, so he rarely uses his geokinesis magic. River Rose - This Catahoula Bulldog x Pitbull mix dog is the perfect match for Alcaeus. She's got attitude, is loyal, and won't be misleading him into anything. She's a gorgeous brindle with beautiful, warm brown eyes. She not only protects Alcaeus, but she also protects those who are close to him. She does not know of his past confidant, but she also doesn't want to know. She is focused on making sure Alcaeus is safe and feels loved constantly.